New waterfront construction or remodeling waterfront property requires compliance with Shoreline Master Programs, which includes federal regulations, local regulations, cultural resources, and other reviews – each one of these can be a complicated process to navigate and can require multiple strategies. 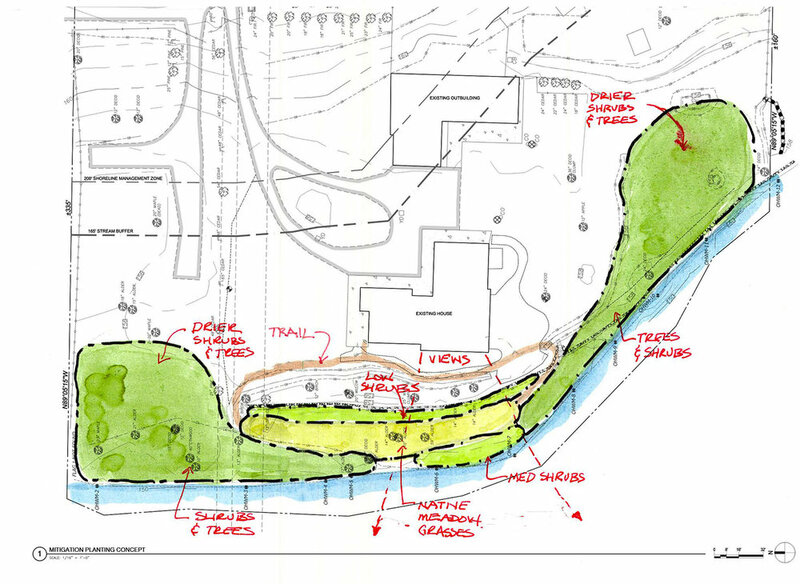 Hiring a knowledgeable landscape architect to lead the process at the beginning of the project – before early design milestones - keeps a project from going sideways, saving clients design time and frustration. Land Morphology works with design teams and clients to uncover what is possible before moving too far and too fast down impossible design paths. We are also aware that each situation is different. In order to respond to different situations, Land Morphology has developed an in-house process that emphasizes careful review of regulations prior to the beginning of conceptual design and then again during concept development with the client. For example, will the permit process take so long that construction of shoreline improvements will require water access for construction? How much more will this add to total construction costs? Comprehensive Planning and Strategizing – in collaboration with the team and client – to ensure all the project elements that can impact the permitting /mitigation of a project are considered at one time. Mitigation strategies can then be developed early on to maximize the programmatic potential of the site. Provide No Net Loss Design Solutions that achieve client design aesthetic. With increasingly complex shoreline regulations we are able to meet the clients’ expectations for use and maximizing the footprint of the residence while not compromising aesthetics. Many jurisdictions allow for storm water infiltration strategies that can be incorporated into paving solutions to avoid rain gardens, which most clients perceive as unattractive. 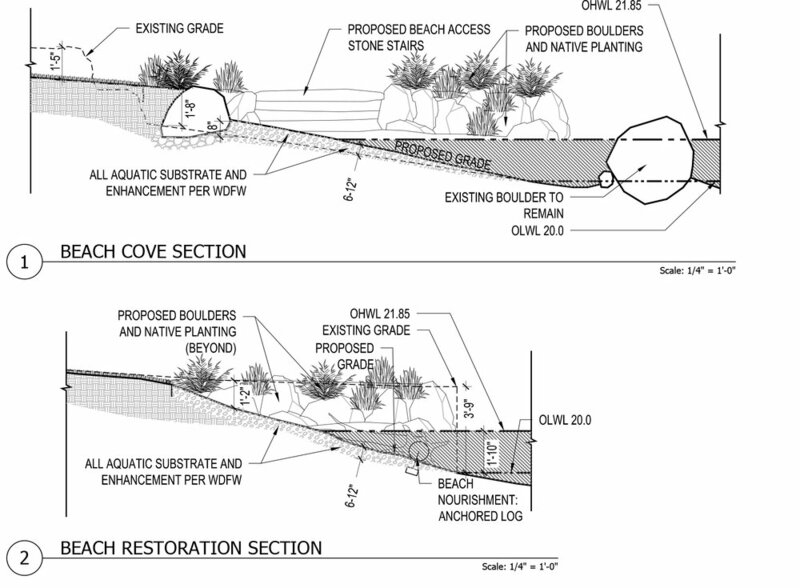 Removing of armored bulk heads along the shoreline to include a beach for easy access to the water for kayaking, paddle boarding, and swimming are popular and attractive solutions that also improve water quality and fish and wildlife habitat. Visually Refined Native Plants With vast knowledge of native plants, we choose plants that are more visually refined and appropriate to the often urban settings of our waterfront projects. This is critical to create a unified project aesthetic that reflects the design teams’ and clients’ expectations. Successful navigation of the process requires the discipline to follow through and a commitment to detail. Our knowledge around local, state, and federal permitting issues allows us to be confident in our approach with the various permitting agencies. Hiring a landscape architect who can navigate the complicated process and who specializes in designing rich, emotive landscapes will result in a beautiful project with no unpleasant surprises. Richard Hartlage is Principal/CEO of Land Morphology and Lindsey Heller, Principal, leads permitting services for the firm.